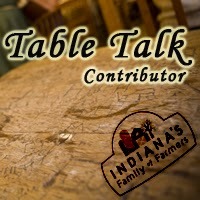 When I was asked to share a recipe with my readers that relates to my farming background, I knew it had to include beef. I was raised on a dairy and grain farm. For several years we also had hogs. Now we live on a beef and grain farm. Growing up, we were definitely a meat and potato kind of family. I am now passing on my love for meat and potatoes to my girls. I think it may be one of the main reasons Brad fell in love with me. When we go to a restaurant, I'm not scared to order a steak or a big ole cheeseburger! 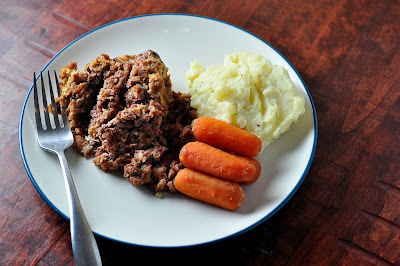 One of the ultimate comfort meals for me is meatloaf, mashed potatoes and carrots. It's pretty easy to make and you have a three course meal in a little over an hour. Form into a loaf and bake at 350 degrees for 50-60 minutes.